Working on the various aspects of the Carvaka since 1995, Bhatta-charya has succeeded in improving on the findings of the earlier scholars. He has not only disproved certain popular notions about the Carvaka but also refuted some claims made by various scholars. Besides, Bhattacharya throws light on some entirely new areas. The book is a collection of twenty three more or less self-complete articles dealing with different aspects of the Carvaka. Bhattacharya charts the history of pre-Carvaka materialist philosophy in India (in chapters II and III) by citing Ajit Kesakambalin, a senior contemporary of the Buddha and Mahavira, and other Buddhist, Jain and Brahminical sources. 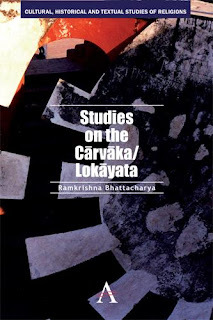 The five commentators (Aviddhar-karna, Bhavivikta Kambalasvatara, Purandara and Udbhatabhatta) of the Carvakasutra who flourished before the eighth century BCE and their works are discussed in some detail in chapter V. Moreover, Bhattacharya discards some of the Carvaka fragments offered by the earlier scholars and discovers some new aphorisms, verses and other fragments in chapter VI. It has been a popular belief regarding the Carvaka-s that they considered sense-experience as the only means of right knowledge. Frauwallner thought that there had been a deviation from this ‘orthodoxy’ in the works of the later materialists like Purandara and others. Bhattacharya disagrees with Frauwallner on this point and shows in chapter IV that Purandara’s admittance of ‘inference as is well-known in the world’ is not a ‘revisionist’ approach but only an expiation on the original Carvaka view regarding the means of right knowledge. In fact, what is advocated is that the limited validity of inference is not doubted by the Carvaka-s. However, the Carvaka-s did not accept inferences that transgress the worldly way in order to prove the existence of the imperishable soul, its transmigration after the death of a person, God, heaven and hell, the omniscient being, etc. As for the two common notions regarding the Carvaka-s that they preached sensual gratification as the summum bonum of life and that pleasure alone is the end of life, Bhattacharya shows that they are false charges leveled against the Carvaka-s by their opponents with an intention to make the doctrine appear morally reprehensible. In fact, this has been the most common practice against all materialists, past and present. Epicurus too had to suffer similar charges. The Carvaka-s did say that there is no pleasure beyond this world. But it does not necessarily mean that they were hedonists. Bhattacharya aptly demonstrates in chapter XIX how the verses were distorted and then attributed to the Carvaka-s. Bhattacharya does not only disprove certain verses ascribed to the Carvaka; he also examines, for the first time, several hitherto unexploited sources (for example, Perso-Arabic in chapter XXII) to study the references made to the Carvaka. No doubt, Bhattacharya's book is an important contribution to the study of the relentless materialist philosophy of ancient India.